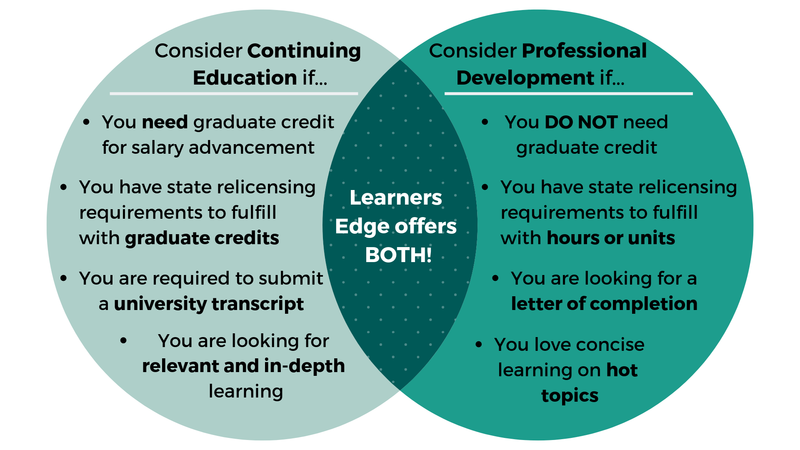 Below is a summary of how Learners Edge may help your continuing education and New Mexico teaching license renewal needs. This summary should in no way release individuals from their responsibility of ensuring that the course they take meets their professional needs. We hope it provides assistance in understanding how Learners Edge might help you in the accumulation of clock hours or graduate credit for salary advancement and the New Mexico teaching relicensure process. See the New Mexico Public Education Department Website for complete NM teacher relicensure information. Every teacher will submit a Professional Development Dossier (PDD) at the end of three years of successful teaching at Level I in order to advance to Level II. Teachers who seek Level III licensure may submit an additional PDD after their third year of successful teaching at Level II. A teacher must apply for Level II licensure at the end of three years of successful teaching at Level I. A teacher seeking Level II Licensure must submit a Professional Development Dossier (PDD) compiled according to the Guidelines. The PDD documentation is a collection of classroom data (lesson descriptions, handouts, student work, video and audio recordings, photos) with explanations of that data written by the teacher, accompanied by verification and recommendation by the district superintendent. The PDD is organized into five strands. These five strands are aligned with the NM Teacher Competencies and are designed to help teachers document their teaching for reviewers from outside their school and district. The booklet, Guidelines for the Preparation of the New Mexico Professional Development Dossier, provides detailed instructions for preparing each strand and for submitting a completed PDD. A teacher is eligible to apply for Level III licensure upon completion of at least three years of successful teaching at Level II AND achievement of either an approved post-baccalaureate (master's) degree or advanced certification from the National Board for Professional Teaching Standards.